Here's the AMOSSHE quarterly bulletin for summer 2014, a roundup of AMOSSHE news, events, project work and more (click image to view - PDF 4.4 MB). 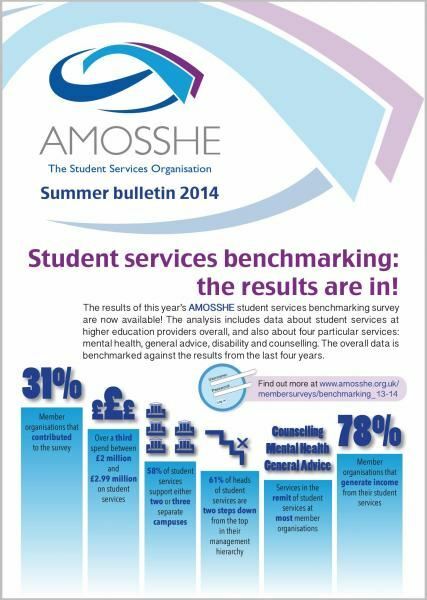 This bulletin contains features about the AMOSSHE student services benchmarking survey, a roundup of AMOSSHE's annual conference, a guide to AMOSSHE's online resources, and more. In 2014 six roles became vacant on the AMOSSHE Executive Committee for a period of two years, from 1 September 2014 to 31 August 2016. AMOSSHE members nominated candidates for these roles, and the new Executive Members were decided by a membership ballot. At AMOSSHE's 2014 AGM in Manchester, our Vice Chair (Operations), Nicole Redman, announced the names of the Executive Members who were elected. Ben Lewis (Director, Student Support and Wellbeing at Cardiff University) will continue as AMOSSHE Chair. Brian Hipkin (Dean of Students at Regent's University London) will continue as AMOSSHE Vice Chair. Mandi Barron, Head of Student Support Services at Bournemouth University. Helen McNeely, Head of Student Affairs at Queen's University Belfast. Ian Munton, Head of Student Support and Development Services, Keele University. Fay Sherrington, Student Wellbeing Services Manager, Lancaster University. In addition, Maria Lorenzini (Director of Student Experience, Bangor University) will take on an Executive Member role for a term of one year. Levi Pay (Head of Student Support & Wellbeing at Northumbria University) has had to stand down from the Executive due to other commitments, so Maria is taking his place and the role will be open for election again next year. Thank you to Levi for all his contributions to the work of the Executive. Congratulations and welcome to all the new Executive Members! "I have been dedicated to developing and growing AMOSSHE for a number of years. AMOSSHE has provided me with a huge range of opportunities and allowed me to develop links with colleagues across the sector which have been invaluable to me. "We are now in a strong position with a new National Office team, more accessible membership structure and a more diverse range of membership engagements and offers (AMOSSHE Futures, AMOSSHE Insight and our CPD programmes). "I am keen to complete this process and embed it over this term of office and work with the Executive to ensure there is in place an outward-looking, stable, secure and diverse student services organisation representing our needs to the sector. Ensure the organisation is in a stable and secure position. Ensure there is an appealing offer to members to join the Executive and engage with members of the Executive. Work with the Executive to ensure that AMOSSHE is membership-led in its strategy and priorities. Grow and develop AMOSSHE's influence with policy makers in partnership with the National Office team. Be a leading voice in the sector for and on behalf of members." "I can contribute to AMOSSHE a unique blend and depth of experience. Having been an academic for 18 years and now a university senior manager for almost as long, I have held a focus on the student experience all my working life - work that has taken me across all mission groups. For the past ten years I have been an active member of AMOSSHE, presenting at conference,running CPD events and over the last four a member of the Executive Committee with the last two as Vice Chair. There is still so much that I want to contribute to our students and AMOSSHE members. It is a privilege to have been so closely involved with promoting the interests of students via AMOSSHE. I am now seeking the opportunity to not only continue to do so for two more years but to continue to develop and extend my contribution to our organisation. Being a member of the Executive provides a unique opportunity to help shape the future of student services at a national level at a time of both challenge and opportunity both for our students and our members. "I have held university senior management roles in a number of institutions for the last 17 years and undertaken consultancy roles within higher education both in the UK and around the world. I am seeking the opportunity to continue contributing as Vice Chair to the very real progress that I believe AMOSSHE has been making in the past few years. I can bring to the role and to our members a deep understanding and commitment to our mission and our values. The Vice Chair needs to be able to draw upon experience and knowledge of higher education, not only from within the UK context but internationally. "The next two years will see AMOSSHE growing and rising to challenges as yet unknown. As Vice Chair I will continue to innovate, represent and above all work with other officers and the Executive of AMOSSHE to ensure that our organisation continues to thrive and that its voice is heard loud and clear in the sector." "I have been the institutional AMOSSHE lead at Bournemouth University for over five years and I have found the support and sharing of best practice from other members to be incredibly helpful in informing and shaping what we do at BU. "I have led a number of changes to student services within my own organisation and monitored developments across the sector with interest to improve and enhance what we do with limited resources. "I believe that the time has come for HEIs to take a completely fresh look at the way we support students - or more properly help them to help themselves - so that we can meet the changing demands not only from our students but also from our other stakeholders. "I believe that my role as elected governor on the University Board, and my membership of a number of internal and external boards and committees, including QAA advisory groups for the Code of Practice, would stand me in good stead should I be elected to the AMOSSHE executive. I would relish the opportunity to be involved at this very exciting time." "I’ve been working within student services for 19 years now, so I’ve been able to observe AMOSSHE growing from strength to strength supporting the professional development of student services and representing our voice within the sector. I’d like to make a contribution to AMOSSHE’s work as a member of the Executive Committee. I’ve been in my current role as Director of Student Experience at Bangor University for four years, and was previously at the University of Leicester for 15 years, where my last role was as Head of Student Development. My approach to managing student services has been underpinned by the belief that all student service professionals have expertise that can be used institutionally if they have strong representation at management level to ensure they feed into institutional policies and decision making. "My current role as Director of Student Experience is dual: it combines overall management of student services with responsibility for our university’s Student Experience Enhancement Strategy. I’ve needed to develop a broad understanding of the inter-related agendas and interests within a university, and the sector as a whole, in order to create a forward-thinking strategy that all university staff can identify with and contribute to. I’ve embedded partnership working with students as the underlining theme of the strategy, and this has been a launching pad for a wide range of student-led initiatives across the university. It is important to me that the strategy includes a strong commitment to the development of an inclusive campus community, and I've utilised the expertise of student services staff to promote equality of opportunity across all aspects of the student experience. "I hope my experience of promoting the strategic importance of student service professions would be useful to the Executive Committee in championing the value of student services within the sector." "I have worked in student services in three different universities, in England and in my current role, Head of Student Affairs at Queen’s University Belfast. Across these roles I have managed Student Advice, Disability Services, Counselling, International Student Support and Registry Services and Systems. My current role incorporates student support services as well as the academic audit functions of the university – an accidental marriage that has proven to be strategically very important in terms of helping improve the overall student experience. The audit role includes managing student academic appeals and complaints, many of which include a student support element and therefore provides an invaluable insight into the changing needs and perceptions of students. Regionally I am involved with other local higher and further education providers in an implementation group for the Northern Ireland Strategy for Higher Education. "Being part of the AMOSSHE Executive and bringing the views of a university in a devolved administration would help shape the national debate on promoting student wellbeing. I have been a member of AMOSSHE since I started in higher education in 1997 and would welcome the opportunity to serve on the executive and contribute to an organisation that has been essential to my professional career." "I've enjoyed six months on the AMOSSHE Executive this year - it's been a fantastic experience, and one that has provided me the opportunity to contribute to real change and direction for our profession. It has, however flown by and as such I am keen to commit more time and energy to contributing to the continued advancement of our profession through a position as an AMOSSHE Executive Member. "We say this every year, but it feels more so than ever that we are at a juncture where in order to move forward we need to make many important and challenging decisions - being in a position to listen and learn from AMOSSHE members in order to drive forward change is exactly why I want to continue in my position as Executive Member. "My career in the Student Services profession has spanned 10 years across three institutions, all of which are markedly different from one another; for the last four years I have worked at Keele University, as Head of Student Support and Development Services. The thread that runs through my career has been the importance of effective relationships – I think that nothing else has quite served me as well in developing trust, partnership and effective services. I see this as a pivotal role of an Executive Member and would welcome the opportunity to develop effective, professional relationships with and on behalf of AMOSSHE in order that we can continue to respond to challenges as they arise, but also lead on initiatives and themes that will influence and form our thinking around student services, now and into the future." "I am currently an Executive Member of AMOSSHE and the Student Wellbeing Services Manager at Lancaster University. I manage a range of student facing support services, including student funding, wellbeing, counselling, mental health and disability support. "I have worked in Student Services in an educational environment for over nine years, taking on a variety of roles and responsibilities. I have a particular interest in wellbeing, counselling and mental health support, customer service and people management. I have been involved in various training and development courses and have achieved an MSc in Management Practice. AMOSSHE/NASPA exchange to Rochester, New York in June 2011. Serving for two years on the Executive from 2012-2014. Co-leading the organisation and running of the one day conference 'Making the Most of Counselling Services' in April 2013. Shadowing AMOSSHE annual conference planning in 2013 and delivering a workshop at the event. Assisting in the setting up of AMOSSHE North regional meetings to enable local best practice sharing. Chairing an AMOSSHE Futures event in May 2014. Currently co-leading the planning of the annual AMOSSHE conference for July 2014. "I have really enjoyed my involvement in AMOSSHE over the past few years and would love the opportunity to remain on the Executive for a further term. Being involved in AMOSSHE has provided me with new experiences and skills which have been invaluable in my role and career development. I would therefore like to be able to offer my time and enthusiasm to the Executive for another two years. If I was re-elected I would continue to support AMOSSHE’s work and would be pleased to co-lead the annual conference again or provide support to new leads if needed." Here's the AMOSSHE quarterly bulletin for spring 2014 (click image to view - PDF 2.4 MB). On Monday 7 April 2014 the Rt Hon David Willetts, Minister for Universities and Science, released a ministerial statement that represents a reduction in the available resource to support access to higher education for disabled people. AMOSSHE, the Student Services Organisation, which represents leaders in student services across UK higher education, is concerned that the proposal set out in the statement will remove funding that has been shown to make a positive difference to the attainment of disabled students in higher education. Universities have made significant progress in main-streaming adjustments to the curriculum to improve access for disabled people. The Disabled Students' Allowance (DSA) has consistently been proven to make a difference to disabled students. This proposal will also pose a significant resource problem for higher education providers in general, and student services departments in particular. Student services departments will have to consider how these changes may affect demand for other overstretched services that they offer, such as counselling, study skills classes and mentoring. With the recently announced cessation of the Access to Learning Fund (ALF) in England, this further change to higher education student support represents another significant reduction in the funding designed to improve access for people from backgrounds that make them less likely to participate and succeed in higher education. It is regrettable that changes of this nature were not subject to full consultation or equality impact assessment prior to their publication. We note that details and specifics behind the ministerial statement remain unclear. Representatives of the AMOSSHE Executive Board look forward to engaging positively with officials from the Department for Business, Innovation & Skills to ensure that any changes are introduced effectively. You can read David Willetts' ministerial statement here: www.gov.uk/government/speeches/higher-education-student-support-changes-to-disabled-students-allowances-dsa. The International Association of Student Affairs & Services (IASAS) is celebrating its chartering as a legal entity under Belgian and European Union statutes today (25 July 2013) in Brussels, Belgium. "AMOSSHE, the UK Student Services Organisation, is delighted to be a part of IASAS. The student experience has always been our key concern, and we’re excited that we, along with higher education Student Services leaders from across the world, now have the vehicle of IASAS through which to learn from each other. We applaud IASAS’ leadership in forging international partnerships amongst Student Services practitioners, especially the opportunities that this great organisation offers for global learning, networking and sharing good practice." In 2013 six roles became vacant on the AMOSSHE Executive Committee for a period of two years, from 1 September 2013 to 31 August 2015. Members nominated candidates for these roles, and the new Executive Members were decided by a membership ballot. At AMOSSHE's 2013 AGM in Liverpool, our Vice Chair, Brian Hipkin, announced the names of the Executive Members who were elected. Nicole Redman, Head of SMART at the University of East London, continues in her role as Vice Chair (Operations) for AMOSSHE. Jayne Aldridge, Deputy Director (Student Services) at Kingston University. Ben Bailey, Senior Assistant Registrar at the University of Derby, returning for another term. Christine Lowther, Director of Student Services at the University of Glasgow. Levi Pay, Head of Student Support and Wellbeing at Northumbria University. Congratulations and welcome to all the new Executive Members. There were no nominations for the Vice Chair (Finance) role, so members agreed at the AGM that when Gill Jack steps down, there will be no immediate replacement. Instead, a new role will be created: Vice Chair (Development), which will focus on the ongoing development of AMOSSHE as an organisation in terms of funding and sponsorship. Day-to-day finance responsibilities will devolve to the National Office Head of Development and Operations role. When the new Executive meet for the first time in October 2013, they will nominate someone from among themselves to become Vice Chair (Development), and that role will be eligible for nomination in 2014. For the week of 10 to 14 June 2013 five representatives of NASPA, the leading association for the advancement, health, and sustainability of the student affairs profession in the US, visited the UK to see some of our institutions and find out about the world of student services in the UK. Shelby Harris, Assistant Dean of Students at the University of Massachusetts, Boston. The delegates had a full agenda for the week. Monday started with a visit to the London School of Economics (LSE). 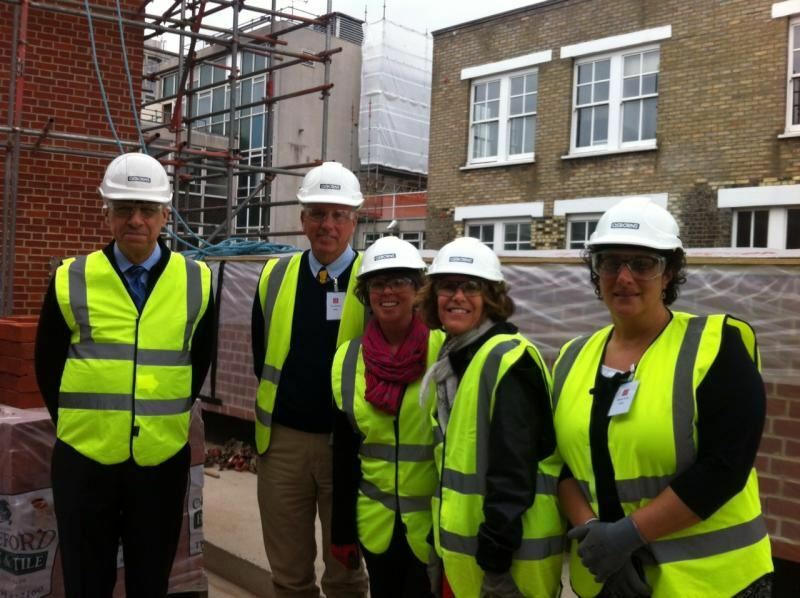 Hard hats and high-vis jackets were the order of the day as they took a look at the works on a new student services centre. LSE also kindly provided accommodation for the delegates all week, but on Tuesday our US colleagues took a trip out of London to see the University of Surrey. The programme for the week took in a range of different sorts of institutions, so on Wednesday, back in London, the delegates visited the School of Oriental and African Studies (SOAS) and Regent's University. The British summer started to show its face a little on Thursday for a trip out to the Royal Veterinary College, and finally on Friday AMOSSHE welcomed the delegates to our National Office to meet some of the Executive Committee and members of AMOSSHE's London and South East Region group. The exchange highlighted many differences between the student services and higher education models in the US and UK, but also brought many more commonalities to the fore. Thank you to everyone involved in the exchange, especially our NASPA colleagues and UK host institutions. Find out more about NASPA. Commenting on HEFCE (Higher Education Funding Council for England)’s report 'Higher Education in England Impact of the 2012 reforms' AMOSSHE welcomes confirmation of the relative financial health of the sector despite the 2012 changes, but expresses concerns at the implications of the decline in part time applications for Student Services provision. “The huge range of services that we provide for students need to change and continue to grow to meet the demands of a changing student demographic. Our universities have to enable us to do this by providing the right level of resource to their Student Services departments. This is incredibly difficult to juggle when we are experiencing both a decline in part-time applications and increased emphasis on widening participation drivers. But, there is hope: our teams are used to delivering to changing student needs, and can do much to help with this across universities and colleges. “Now, more than ever, there is direct economic correlation between ensuring our students expectations are met and income to higher education providers via the tuition fee. Student Services can help our institutions to deliver excellent student experiences." AMOSSHE welcomes the affirmations in the report 'Higher Education in England Impact of the 2012 reforms' of commitments to the student experience, and will look to the more detailed work that HEFCE is planning around part-time applications with interest. AMOSSHE members can access a brief policy briefing that considers the key messages in Higher Education in England Impact of the 2012 reforms specifically for Student Services by logging into the members’ area. AMOSSHE is the UK higher education Student Services Organisation. AMOSSHE informs and supports the leaders of Student Services, and represents, advocates for, and promotes the student experience. 149 higher education institutions (HEIs) are members of AMOSSHE with some 500 named individuals associated with membership. AMOSSHE members shape the student experience in higher education. AMOSSHE empowers Student Service leaders. AMOSSHE is a key voice of student experience leaders. AMOSSHE, the national Student Services Organisation, is supporting five of its members to deliver short, fixed projects looking into Student Services. The teams will all report by summer 2013, and research spans a range of the services that members work across. "I am delighted that AMOSSHE is directly supporting work in Student Services across the UK on developing what we offer and evidencing our impact. We’re enabling staff in teams who might not otherwise have been able to pursue projects to help shape the future of their field. When the panel convened to consider the funding proposals, we were so impressed with the quality and breadth of ideas that we agreed to double the amount of funding for the #amossheis20 projects. To have five new pieces of work report at our annual conference ‘Imagine…’ this summer is exciting for delegates, and we hope for many other staff in the sector across the UK." All of the projects’ outputs will be available in summer 2013. The projects have been funded as part of a range of activities to mark AMOSSHE’s twentieth year. This summer will also see the issue of a commemorative publication. Follow the celebrations on twitter @amosshe_uk or using #amossheis20. AMOSSHE marked its twentieth birthday in 2012/13 with a range of events and membership resources. The Association of Heads of Polytechnic Student Services was established in 1976. Its constitution was rewritten in 1992, formally creating the Association of Managers of Student Services in Higher Education. This evolved into AMOSSHE, the Student Services Organisation. As part of this remit, and in light of 2012/13 being our twentieth year, AMOSSHE undertook a programme of celebratory activity, inviting members to drive this work. In early January 2013, AMOSSHE invited members to put forward ideas for small research projects in any area of Student Services. We received several high quality proposals, and were so impressed we invested reserves in funding more work than we had originally anticipated: five projects in all. These projects are part of our commitment to a membership priority led research agenda, supporting members’ professional development, and broadening the evidence base for Student Services in the UK. The small research projects support innovative activity or learning in Student Services that would not normally attract full funding from within the practitioner’s university. Our critiera included clear benefits to the wider AMOSSHE community to learn from the project. As a result of the expertise, high standards and dedication of the AMOSSHE member project teams, the twentieth anniversary projects were extremely successful, and made a real impact in the sector. Because of this, AMOSSHE is dedicated to a continuing programme of funding for member-led projects. This programme of funding is called AMOSSHE Insight.